As a major funding conference opens in London, IRIN has run the numbers. Which countries can claim to be doing the most for the Syria crisis? Here we compare 29 aid donors (to Syria, Turkey, Lebanon and Jordan) and refugee-hosting countries. The most generous countries would be found to the top-right: they give a lot, and host a lot. Those at the bottom left are not giving much compared to their wealth, nor are they hosting many registered refugees. The refugee figures are only for registered refugees, as of mid-2015, and several Gulf countries report that they host large numbers of Syrians, but not on a refugee basis. The humanitarian aid figures are for 2015, as tracked by the UN. To give credit where credit is due, these countries have provided either cash or asylum. Many have given neither. Scroll down to see the list of shame. The following high-income countries report their humanitarian aid to the UN's Financial Tracking System, but provided no details of bilateral funding for Syria, Lebanon, Jordan or Turkey in 2015. Correction: an earlier version of this post stated that the Republic of Korea had reported no contributions. This was due to a coding error. However it is listed as donating a modest $10.5 million to the target countries during 2015. Unlike the graph above, this does not taken into account the volume of aid relative to national income. Much has been made about which countries are or aren't doing enough for Syrian refugees. Governments across the Western world claim to be doing their bit, Gulf countries have reacted angrily to accusations they have done too little. Leaving aside political or military influence, countries can help alleviate the situation in two major ways: by taking in refugees or funding the humanitarian response. Both deserve credit. Some do both. The donors tend to keep their borders closed but give money to the humanitarian response. By providing funding to humanitarian operations, they may also hope to keep refugees in these countries or Syrians at home. Typically the biggest donors to the Syrian humanitarian crisis have taken only small numbers of refugees. On the other hand, neighbouring countries have hosted the majority of refugees, and in the case of Turkey, spent billions of their own income on them. Jordan, Lebanon and Iraq are not international donors and have needed, and received, more international aid to cope with the influx. Our graphic show the 28 countries that have made the biggest effort in terms of cash or taking in refugees. The numbers of Syrians who are resident abroad on work visas or other immigration arrangements are not sufficiently clear to be factored in. Refugee data is the latest available and emergency funding figures are from mid-September. The graph does not compare absolute volumes. Instead, giving credit where (some) credit is due, we included the twenty countries hosting the most Syrian refugees, and the twenty countries providing the most aid this year and combined them. We found 28 countries that are doing something significant for Syrian refugees. 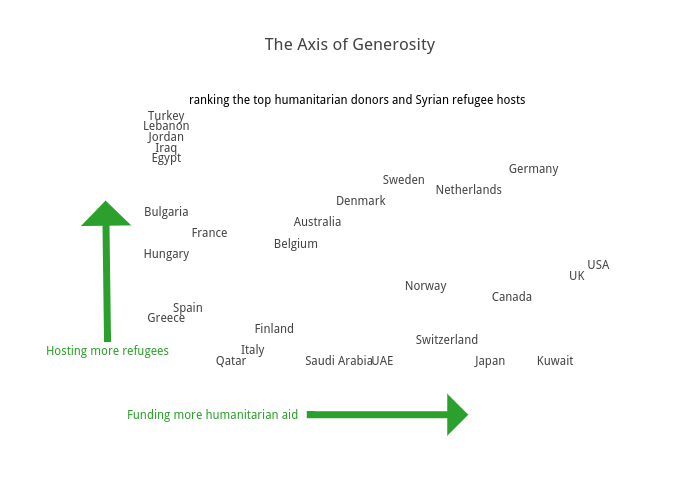 We ranked them and then plotted their rankings on cash giving and refugee hosting to make this: “The Axis of Generosity”. We took the 20 largest humanitarian donors to Syria and the regional refugee crisis in 2015 from FTS. The UN-managed FTS is based on voluntary reporting by aid agencies and governments, and may undercount private donations and generally excludes major domestic expenditure by countries hosting refugees. We used only funds marked as "commitment" or "paid" from the FTS data, excluding “pledges” whose details have not come through. We did not include funding for Syrian refugees in Iraq, as the figures were less easy to separate from spending unrelated to the Syria crisis. We included all humanitarian spending in Syria, Jordan and Lebanon, given the overwhelming majority of funding there is related to the Syria crisis. The data was gathered on 16 September, and totalled over $3 billion. While the EU as a whole is a major donor, we looked at where EU countries had made additional voluntary funding available, beyond that channeled from their membership dues to the EU. Since the EU cannot grant asylum or resettlement, the chart looks only at the relative contributions of nation states. For the refugee ranking, we used published figures of Syrian refugees hosted, as well as numbers of refugees resettled (see here for more on resettlement). These figures were mainly from UNHCR and the European Commission. Resettlement figures were from a variety of sources, mainly media reports or national statistical authorities when available. Apart from Turkey, Jordan, Lebanon, Egypt and Iraq, the refugees hosted are those registered from 2014 onwards. (Very few were registered outside the region before that point). Data sources: UNHCR, EUROSTAT, media reports. The data is available as a spreadsheet here. Please get in touch if you spot errors or omissions at feedback@Irinnews.org or on Twitter.